Detecting chart patterns is always a special joy to code if provided rules are well thought-out and fully mechanical. Such is the clear definition of flag pattern given by author Markos Katsanos in December 2014 issue of Stocks & Commodities. Flag depth not more than D times the ATR measured from the highest to the lowest point in the flag. Uptrend during the last E bars leading to the pole. Figure 1. 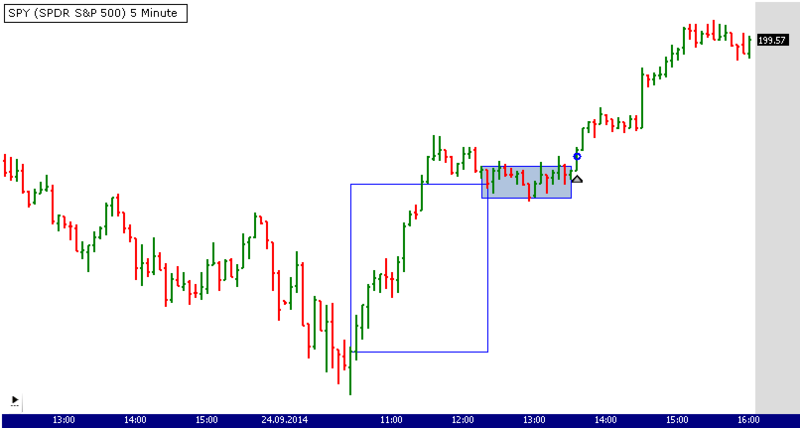 A Wealth-Lab 6 chart illustrating the detection of the flag pattern on a 5-minute chart chart of SPY (S&P 500 SPDR). Figure 2. 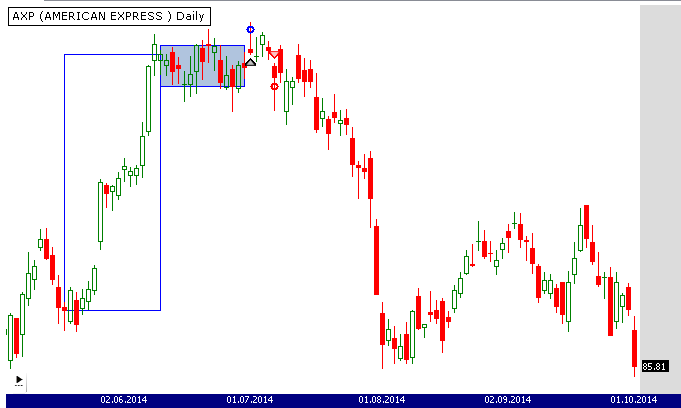 A failed flag on the Daily chart of AXP (American Express) in Wealth-Lab 6. There's room for improvement: consider adding a filter against erratic price movement, phase out the less probable trades against the medium-term (daily) trend, playing with the exits (to our taste, the initial stop at the flag bottom may result in premature exits; subtracting an ATR from that level could be a more robust approach etc). Also, there's a closely similar system looking for tight consolidation ranges, available to Wealth-Lab users for download called «Rectangle Trading System (Acme R)». Along with other related systems mechanically identifying chart patterns, look for it in the «Chart Patterns» folder after having downloaded all publicly available strategies (click “Download” in the “Open Strategy” dialog). To sum up, the proposed technique is useful to recognize brief retreats in steep trends. //Uptrend during the last 70 bars leading to the pole. //A steep pole of 5.5 times the average true range (ATR) or more, in 23 bars or less. //A flag breaking out in 15 bars or less from the pole top and sloping horizontally or slightly down. //Flag depth not more than 2.5 times the ATR measured from the highest to the lowest point in the flag.